An approaching nor'easter didn't keep determined volunteers from getting a new landing deck in place at Harbor of Refuge Lighthouse last Saturday. Fourteen members of the Delaware River & Bay Lighthouse Foundation put in eight hours of hard labor on the outer breakwater wall working to get the lighthouse in shape for the tour season that begins next month. Members came from Pennsylvania, Maryland, Virginia and, of course, throughout Delaware to provide muscle for the task. According to Red Moulinier, a Foundation Board member, "that deck is absolutely essential to our operations. Without it, we can't land people at the lighthouse for tours. So the work had to be done before the first tour, and Saturday was when we could get the volunteers to do the work." But as a precaution against the weather , the group installed all the supports and substructure, but laid only half the actual decking. "That way," Moulinier said, "if the predicted weekend storms are bad, we'll learn whether our new methods are up to the challenge. If they are, we can put down the rest of the decking in short order before the tours start. If they aren't, we'll have to design other ways of attaching the decking, but at least we'll have decking left to put down for the first tour." 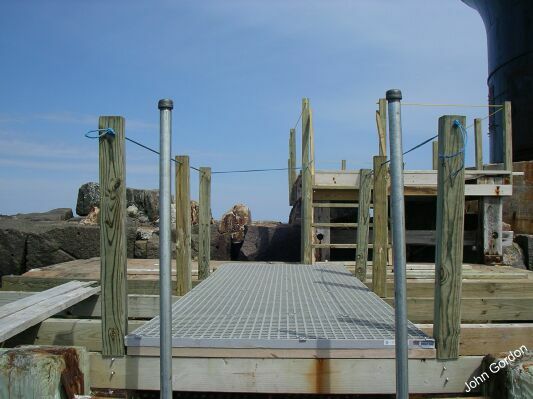 This is the seventh deck the Foundation has installed at Harbor of Refuge since taking over its upkeep in 2003. The last one was fatally damaged by Tropical Storm Ernesto last year, then finished off by winter's winds and waves. The lower landing deck was completely torn away and the upper deck was missing about a third of its boards. All stairs and safety railings were gone as well. For the past several years, the group has used pressure treated lumber for the decks. But this year, they switched to decking made of a non-skid fiberglass composite material that's used for portable docks. Although the new deck material is initially much more expensive than wood, the Foundation hopes that in the long run it will prove to be more durable and, therefore, more cost effective and less time consuming to maintain. Judith Roales, president of the Foundation said, "We haven’t raised new money to pay for the more expensive deck yet, so it’s a strain on our regular operating budget. But keeping the lighthouse open to the public is our Number One priority, so we think this is the right thing to do." While most of the volunteers worked on the decks on Saturday, a small contingent gave Harbor of Refuge and nearby Delaware Breakwater East End Lighthouse a mini-spring cleaning. The lights were swept out from lantern room to entry level, windows were washed, and small repairs were made. If you’ve ever gazed at the lighthouses from Cape Henlopen and wondered what they’re like inside, there’s only one way to find out. That’s to take a tour with the Delaware River & Bay Lighthouse Foundation. This season, they will offer nine Saturday tours to the lighthouses -- on May 19, June 2 and 16, July 7 and 21, August 4 and 18, September 15, and October 6. The tours go by boat to each lighthouse and include a narrated history of the structures and stories of the keeper’s life. You get to climb to the top of the lighthouses and stand on the exterior walkways for an unmatched view of Delaware Bay, Cape Henlopen, and the Lewes beach area. At Delaware Breakwater East End Lighthouse, you can get up close to the historic 1885 Fresnel lens. At Harbor of Refuge Lighthouse, you can inspect a more modern aerobeacon optic and see the large solar panels that power a working backup light. You’ll also learn about the two massive breakwater walls on which the lighthouses stand and see first hand how powerful storm waves have carried away foundation stones weighing up to ten tons each. Price of the three-hour tour is $75 for those who are not members of the Foundation, $65 for members. New memberships are welcome. Reservations are a must because participation is limited by Coast Guard controls on the number of people on the boat. Any profit from the tours is used by the Foundation to continue its maintenance and preservation of Delaware lighthouses.